Yes it is true I am in the town of Bernice, MT. 15 miles west of Boulder, MT. I am staying (with much gratitude) with Karen and Steve Davidson where the horses are tucked nicely in corrals with hay and grain and water and protection from the snow storm that has descended upon us. 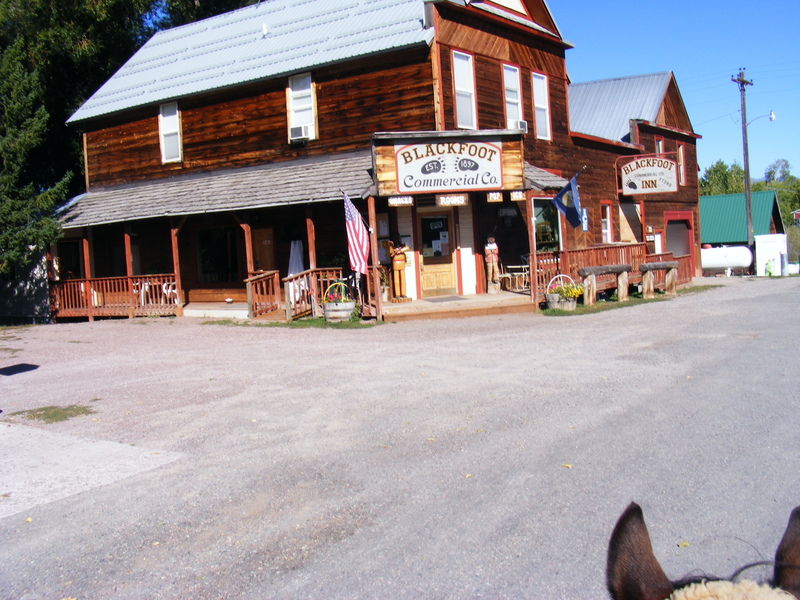 Thank you Karen and Steve… Bernice, Montana has no real town remaining except an exit off the freeway, a few ancient looking buildings that were once the stage coach stop and the road departments maintenance buildings. The name Bernice came from the wife of one of the surveyors first laying out the roads and rail road. It is now covered in snow with the storm that has moved in and my oh my it does have me wondering what the return trip will be like. “But why did you ride over to Boulder?” you might ask. Well it was to see a childhood friend named Paulette Smith. Paulette and I rode horses, ran wild as young children between the ages of 6 and 9 across the gentle Minnesota farm land that I grew up in. She had a profound effect on me and my rides today, although I did not in any way think so at that time. But you must hear how I came to connect with this friend I once knew 48 years ago, a good story…. In 2011 I was coming in from a 6000 mile ride. I had been out 2 1/2 years on that ride. It was early spring, snow, wind and rain had me moving slow but steady making my way westward from eastern Montana. I had been caught in yet another snow storm south of Boulder and really had not planned on riding thru the town but would skirt it and go up over Champion pass. But I needed supplies so I rode into Boulder, way off my scheduled time. 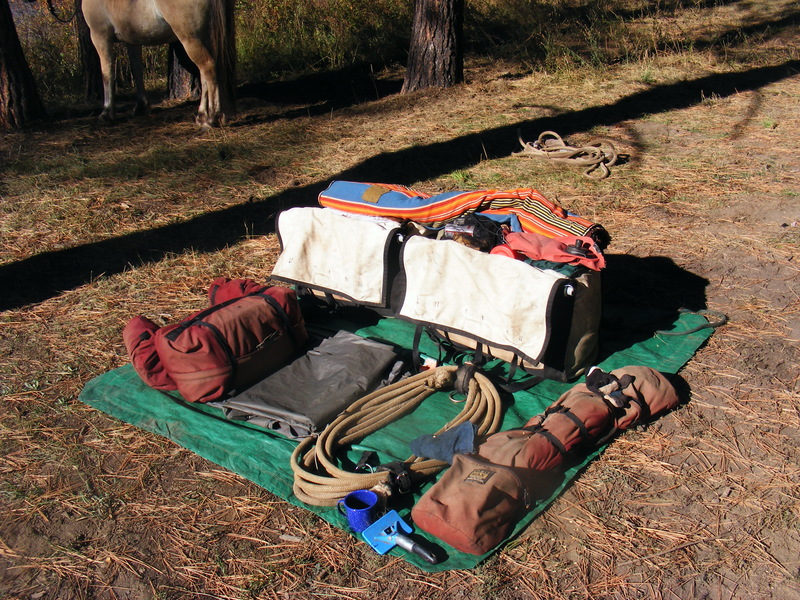 I was tired, dirty and still had a couple of hours to get camp set up and the horses taken care of. 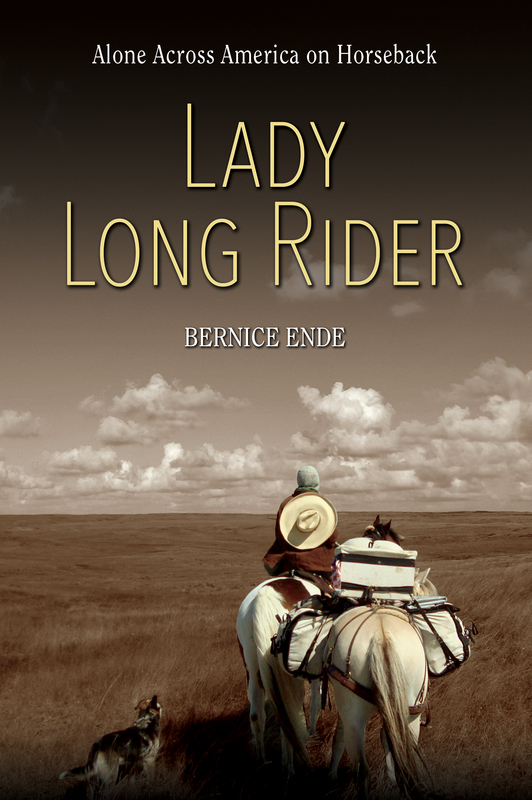 So when a woman I did not recognize walked into the building at the fair ground, I did not take much notice until she started asking questions…” Are you that woman riding across the country?” she asked. “yes I am” I replied. ” Are you from Minnesota?” “yes I am”. Did you live in Rogers, Minnesota?”, “Yes I did”. Now at this point I turned and looked long at this woman. “Paulette?” I asked, squinting in disbelief. “Paulette Axt?” Well you can only imagine how we both in complete disbelief at this chance meeting must have felt. That is how I came to meet up with my child hood friend that I had not seen in 48 years. WOW that is a Wow. So I decided to ride over and see her again. Once again I am way off schedule and late and the weather looks down on me with “will she make it?. “will she make it?” Yes of course I will I defiantly think. But I will not be staying long, I head back home on Saturday. At this point I would like to recap my ride from Seeley Lake, Montana to here with photos and a few stories. 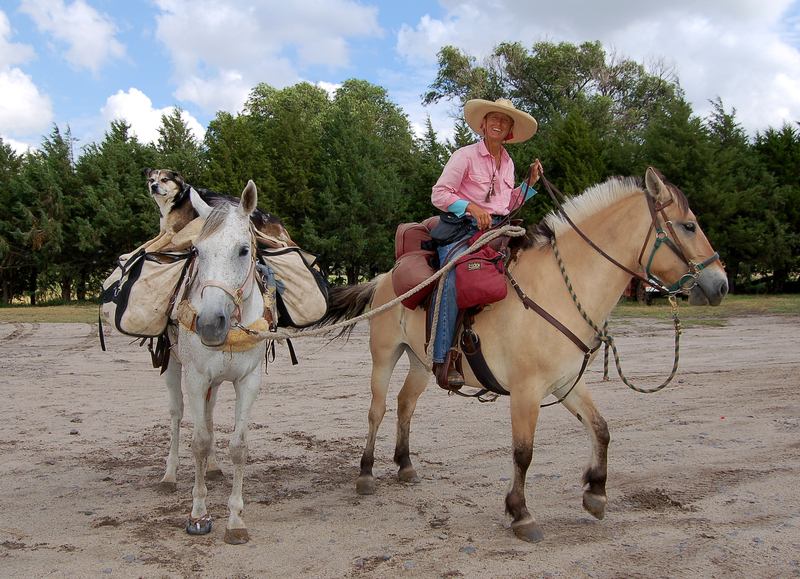 Peggy Fly and her husband Howie greeted me when I rode into this charming, quaint, creative town of Ovando. 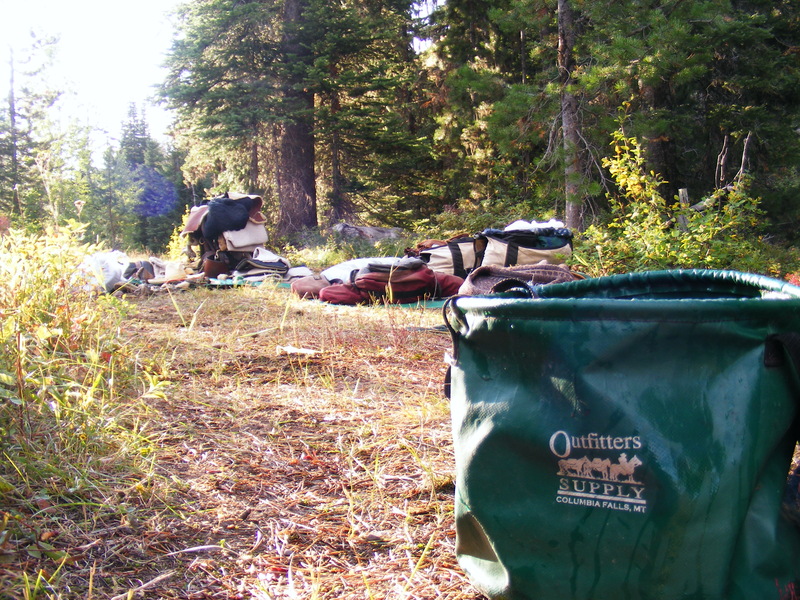 My horses were tied in a corral as we decided where best to put me for the night. I bought a sack of grain for the horses and had a cup of hot coffee from their store. This town is visually eye catching. This town said, ” hell no we won’t go”, the community dug their heels in with tremendous force and creativity, etched out a new model for the people and surrounding ranches and here they are alive and well and what a model they are for other communities struggling to survive. There were many other travelers crisscrossing thru the Blackfoot Valley. 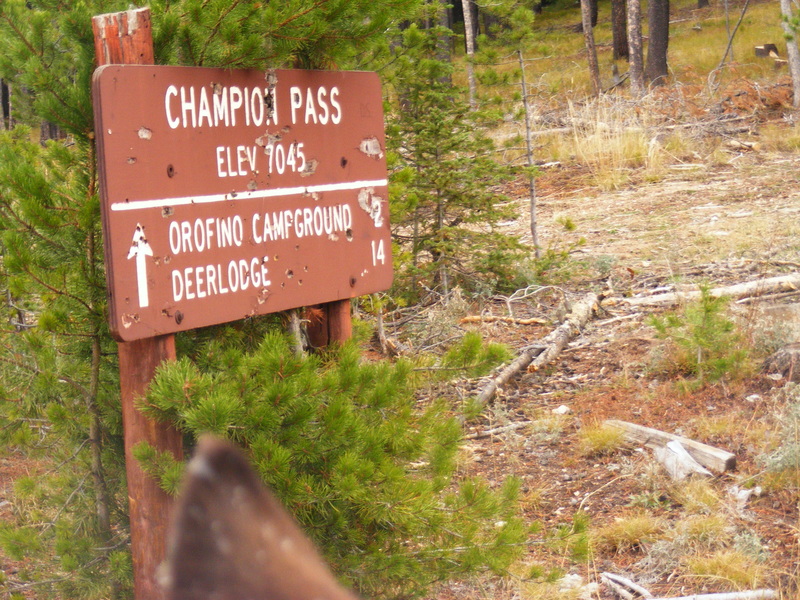 The CDT- the Continental Divide Trail is not far from Ovando and this is one of the hiker’s stops. Bikers, thats motorcyclists, bicyclists, hunters, and ranchers alike sat at the Stray Bullet for breakfast… This was written in the menu and I think it sums it up…”Welcome to the Stay Bullet in Ovando, Montana. I am proud to be a 5th generation family from the Blackfoot Valley. This valley is a remarkable example of landowners, neighbors and sportsmen working together to show our pride and respect for this landscape. We make every effort to use the local products and businesses to help sustain our community by providing quality service and a taste of the west. To the locals, I thank you for your support, and to those of you passing through, we hope you enjoy your stay and spend sometime exploring this one of a kind community. Cheers, Colleen Zoe Stone, Family and Friends. 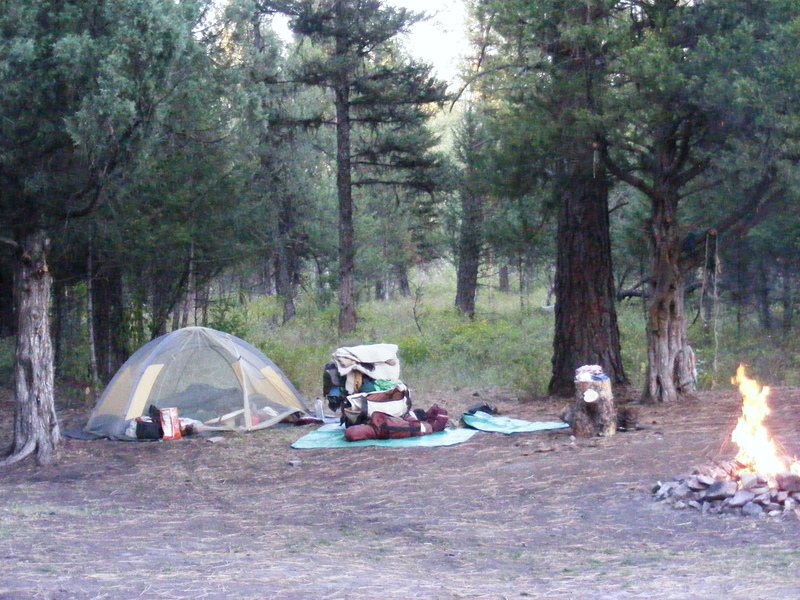 The Town also is home to the BlackFoot Challenge a private non-profit organization with the mission to coordinate efforts that conserve and enhance the natural resources and rural way of life in the Blackfoot Watershed for present and future generation. The big word is sustainability!! It has been 20 years since the Challenge was founded in the spirit of partnership, since then the group has worked to conserve working landscapes throughout the valley, protect a rural way of life, control noxious weeds, address drought and mitigate wildlife conflicts. And you know what this Valley these communities of Ovando and Helmville that I rode through have made a successful story out their efforts…What a remarkable place it was. I remember writing in my journal..” I feel like I have ridden into the “unusual”. 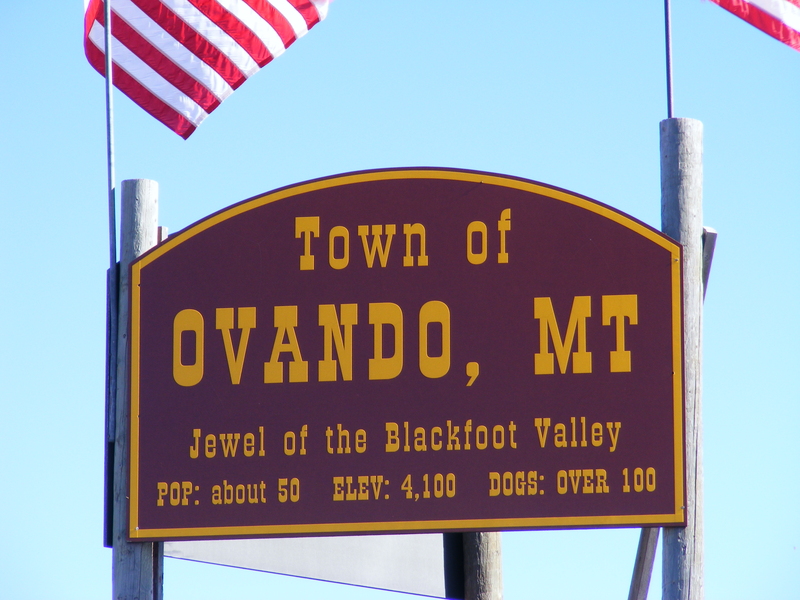 Both Ovando and The Blackfoot Challenge have websites well worth checking into. 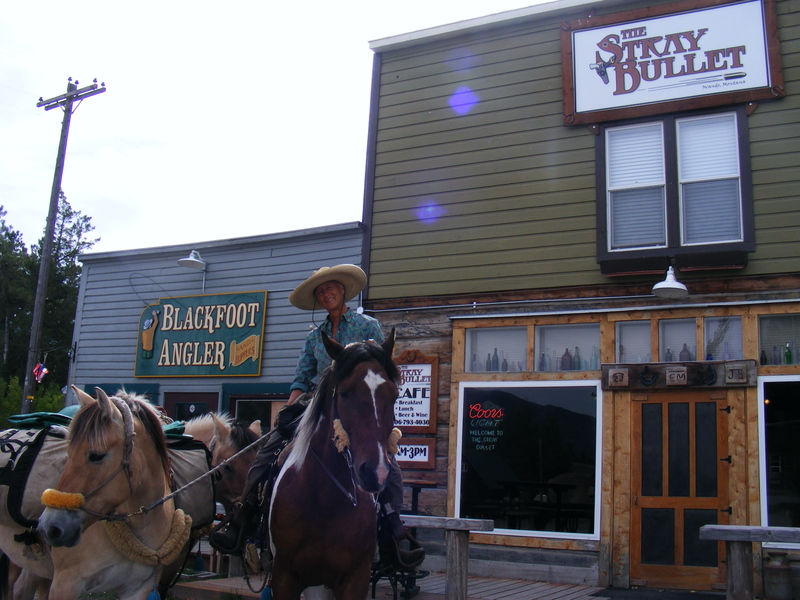 I saw more of this collaboration between ranchers, the hunter/fisherman and tourist as I rode through Helmville, MT. 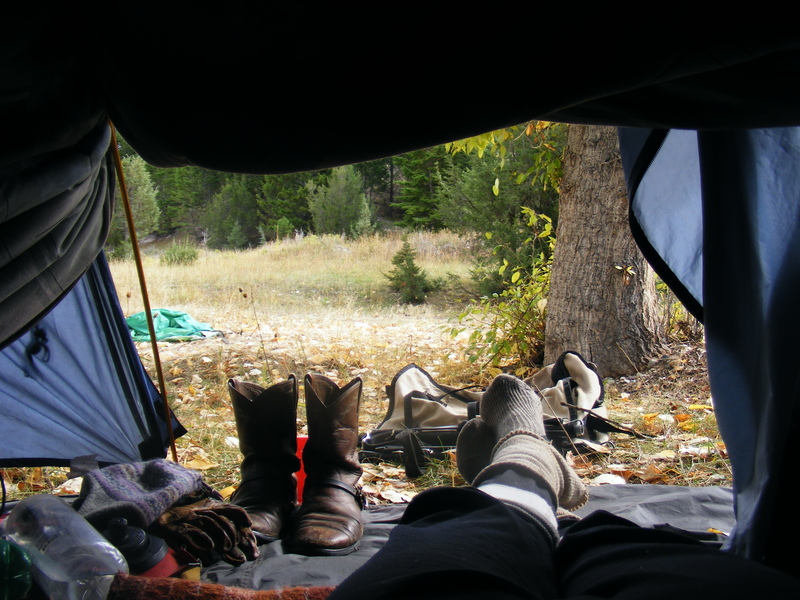 There I was greeted into town by the folks from the Bignell Ranch who sent me over to The Geary Ranch where Bob Geary opened up the rodeo grounds for me to camp at and showed me the breathtaking beauty of the Nevada Creek Valley. I met with David and Peggy Mannix who helped me with directions to cross the Garnett Mountains. The Mannix Ranch is another example of a family successfully reaching out for alternative ways to keep the family ranch thriving by raising naturally fed beef. It is absolutely essential that you understand the difference between beef raised in this kind of environment and what is not. The taste and quality of meat is obvious when eaten. The Mannix Ranch Natural Beef. Peggy sent out ground hamburger patties and I was taken back by the taste after I cooked them over the fire, simply delicious and I felt like I could truly enjoy the meat as I knew the animals had been raised humanely from birth to slaughter. Thank you to all of you. A few photos of crossing the Garnett Mountains where I was caught in “weather” and spent 5 days when it should have taken me 2 days to cross. Ran out of food. A local living up there in a remote cabin stopped on her way to Drummond, MT. to ask if I needed anything, she brought back food for me. I then was stopped in Gold Creek, Mt. for another round of wind and rain, it is never dull, this long riding business, NEVER. Well that is enough for now. I hope to be off this weekend. October? could be a cold wet, snowy ride back home. The horses are doing very well. Hart is in great shape and is making his way just fine I am glad I brought him out, there were several situations where it was his steadfast sureness that got us down a busy, dangerous highway. I have got a team that is unbeatable at this point. They are getting lots of grain and carry light loads.